So where are Cannondale bikes made? We can all agree that they’re high quality but where were they created? In this blog post, I’ll be going through just that. Let’s investigate. Who Made Your Bicycle Then? 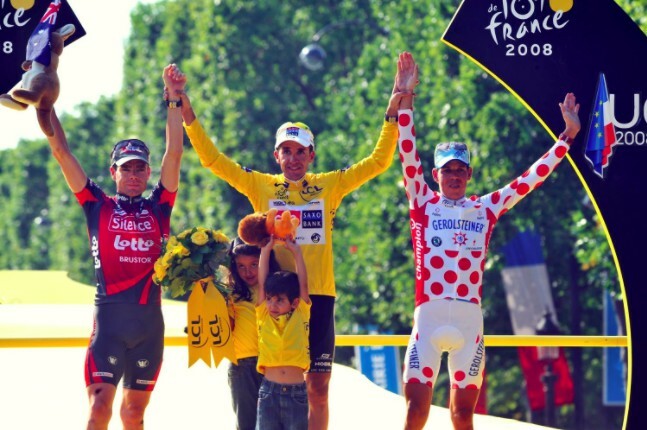 Did you know that the three cyclists on the 2008 Tour de France podium above all used bicycles produced in the same factory? The design and decals of their rides were a little different, but there was only one manufacturer behind the three riders. Back in the day a builder would build a single frame in their workshop and place their name on the downtime. Something that rarely occurs in today’s world unless you decide to invest in a bespoke service. Instead, your Cervelo, Scott, Specialised and Cannondale, were not made by these companies but by a factory else where. The Cannondale Bicycle Corporation is the American division of Dorel Industrie﻿﻿s that supplies cycles. Its headquarters are in Connecticut with their manufacturing and assembly facilities being overseas. Originally cannonades bicycle frames were made in its factory in Bedford, Pennsylvania. In 2009, Dorel Industries announced a restructuring of operation in its recreational/leisure segment. This resulted in the closure of its assembly and testing facility in Bedford, Pennsylvania. Their high-end models are made in Taiwan, and their lower end models are made in Vietnam. There's a good chance that your fame was made by a company you've never heard of. Many companies still make their own frames but the majority of bicycles are made by ​Original Equipment Manufacturers [OEM]. Don't let this put you off the bikes created by these companies require sophisitated high-end design. They were just made under the same roof as lots of other similar brands by a company you've most likely never heard of. Watch the video below to see a comparison of Cannondale bikes from the USA vs Thaiwan.